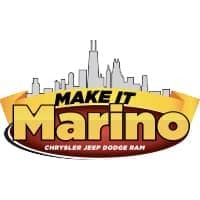 At Marino Chrysler Jeep Dodge Ram, our Vehicle Purchase Programs offer a way for Chicago and Skokie drivers to get behind the wheel of their next vehicle while saving some money at the same time. We have a large inventory near Park Ridge and Forest Park of Chrysler, Jeep, Dodge, and Ram vehicles on our lot for you to see. From the Jeep Cherokee and the Dodge Challenger to the Chrysler Pacifica and the Ram 1500, we believe there’s a car on our lot for just about every driver on the road. This diverse inventory features quite a few CJDR deals, which we’re excited to tell you about. With our CJDR purchase programs, you have the opportunity to save on your next vehicle purchase. You could get 1 percent off the invoice price of a new car, SUV, or truck! 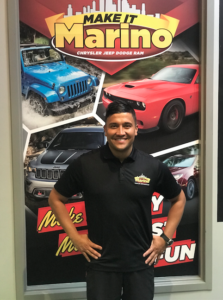 Plus Marino will include an additional $500 discount. This special pricing is available to people employed by various companies in the Chicago area. Employees working for the following companies qualify! Interested in learning more about the program, or want to see if you qualify for this special pricing? Give Juan Carlos or Kenny a call today! Speak Spanish? Ask for Juan Carlos, he’s fluent in both English and Spanish. Hunting for the best financial deal should be our job, not yours. Our financing department can answer any questions you have about buying or leasing your next car. We’ll work with various banks and lenders to find the best deal available at the lowest interest rate. Apply for financing on our website from the convenience of your own home. Fill out this short form and get approved for a purchase. Along with the convenience of the online form, there’s also the payment calculator on our site. Figure out finances with a few clicks and get an estimate of what monthly payments might look like. 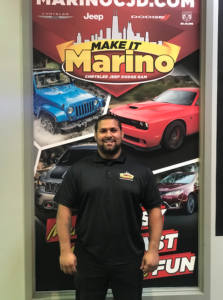 To learn more about the Vehicle Purchase Program at Marino Chrysler Jeep Dodge Ram, get in touch with either Juan Carlos Alvarado or Kenny Sher today. Their contact info can be found above; they want nothing more than to ensure Chicago and Skokie drivers have a car they love to drive. These CJDR deals are open to many motorists in Park Ridge and Forest Park. To see if you qualify, get in touch with us today. We look forward to hearing from you!